Yeshe Long is the dharma center of Kilung Jigme Rinpoche in the West. Yeshe Long means “vast wisdom”. 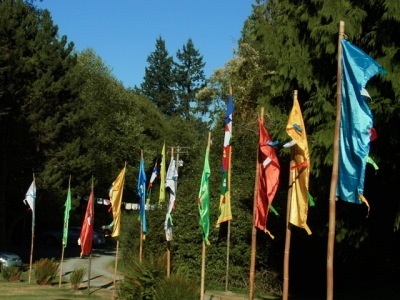 Yeshe Long is the site for Rinpoche’s teachings and meditation retreats, and also houses the Pema Kilaya sangha office, and the office of the Kilung Foundation. Conveniently located 10 minutes from the Clinton/Mukilteo ferry, the center and the land convey a strong feeling of peaceful retreat, sitting amidst 5 acres of beautiful forest, open meadows, flower gardens, and paths. The land is home to wildlife; many varieties of birds, including beautiful barred owls, deer and rabbit wander the grounds and the surrounding forest. Every Monday evening, from 5:30pm – 6:30 pm, practitioners gather for meditation instruction and practice in the Seven Meditations. For the other dharma activities on the land, click HERE. 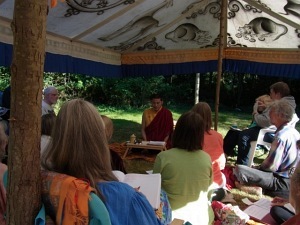 During the summer months, teachings often take place in the shelter of a beautiful nomad tent, brought from Rinpoche’s Tibetan home in the Kilung Valley, in Dzachuka. 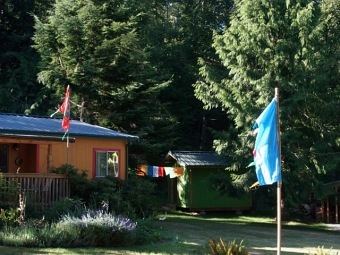 The land of Yeshe Long is also available as a personal retreat site for practioners who are willing to camp, and cook outdoors in our summer kitchen. Yeshe Long is located at 6900 Humphrey Rd., Clinton, WA 98260.